A few months ago I moved out on my own after 14 years of being married. Since I wasn't going to be married anymore I decided it was time I got back into the outdoors and shared some of the experiences I had growing up. One of the things I want to share with my kids is the fun of camping. Now I'm not your average American camper who likes to pack up an air conditioned RV and go out into the woods with all of the same conveniences I would have at home. I like to actually get into nature a bit more. I prefer tent camping. In fact, I prefer backpacking with a small 2 person tent if I can, but with my kids I needed something a little bigger. I opted for the Coleman Signature Instant Tent 6 with a rain fly for when I go camping with my munchkins. It is supposed to fit 6 people (That's pushing it), but the real reason I got it was because of how easy it is to set up. I can unpack this thing and have it up in about 5-10 minutes. Taking it down is a bit longer, but not too bad. It's just really easy to use. As I said, the 6 person limit is really pushing it. I can barely fit myself, my two kids and my dog in it with our gear without stepping on each other. There is a pretty decent amount of standing room in it though, and I can get around in it without crawling. The bag it comes in is pretty big and bulky. This is certainly not a backpacking tent. It is more for the average car camper, and for that it works well. 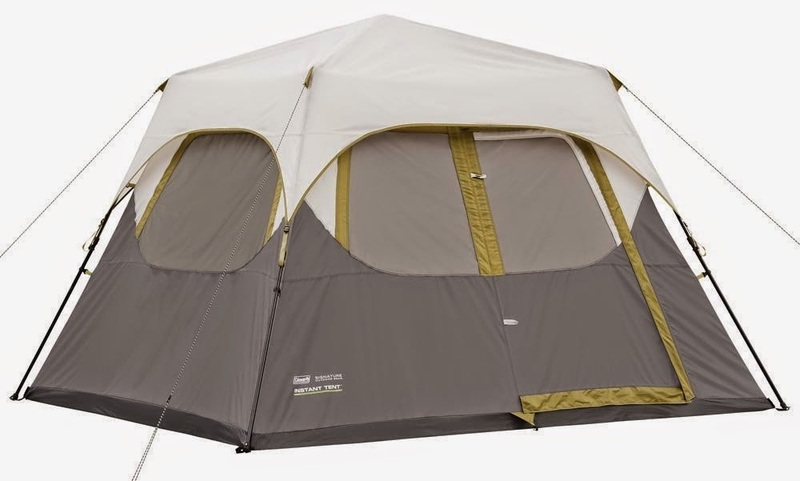 All in all, I highly recommend this tent for family outings!